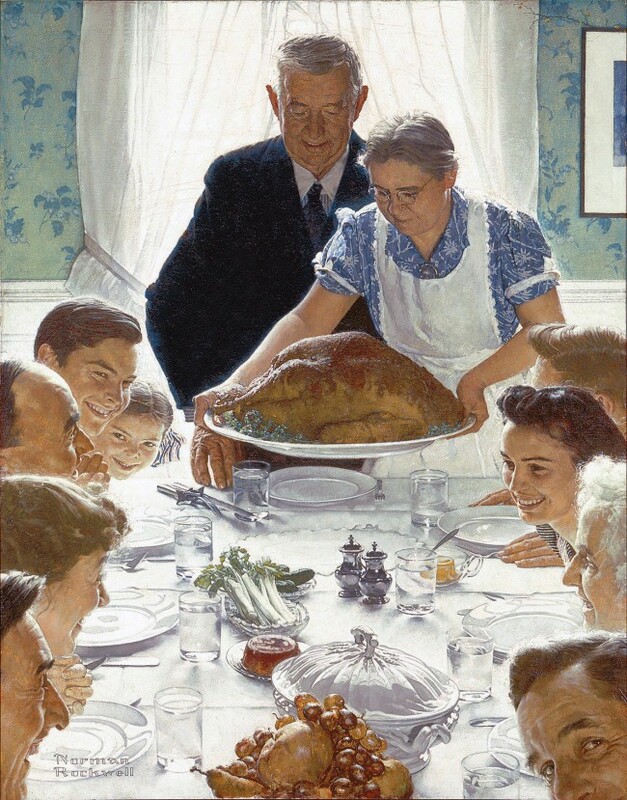 An analysis of the images Rockwell painted to describe Roosevelt’s “Four Freedoms”, and a brief history of the impact these paintings had on America. Tell the class about the speech Roosevelt made during WWII in which he described four freedoms — freedom of speech, freedom from want, freedom to worship, and freedom from fear. His point was that these freedoms should be enjoyed by all people around the world. Share with students the background information (provided). To understand the goals Rockwell had for each image and the choices he made toward achieving those goals and demonstrate this knowledge in ways suggested in this lesson plan. To illustrate a new freedom that could be available to all people everywhere(example: freedom of movement)PreparationLook at Rockwell’s “Four Freedoms”. Freedom from Want, Norman Rockwell. 1943. Freedom of Worship, Freedom of Speech, Freedom from Fear, Norman Rockwell. 1943. Ask students to decide which of the above objectives they would like to do — writing or illustration. Help to clarify their thoughts by guiding them in a brainstorming session, and writing the ideas generated on the blackboard. Combine the illustration of a new freedom with a description of that freedom. Guide students in the development of an outline for their essay. If the illustration assignment was chosen, guide them in the process of creating a preliminary sketch before attempting the finished work. Both of the steps described involve the student in editing and making choices pertinent to their work. Encourage students to write and rewrite, draw and redraw, in an effort to make their work the best it can possibly be. Have students share the work in class and make a display of the art. Have students write exhibit labels for their pieces.